Issac J. Wister (1827-1905), Brigadier General, USA (PA). Colonel of the 71st Pennsylvania Infantry. Participated at Ball's Bluff, Peninsula campaign, Antietam (WIA), Army of the James. 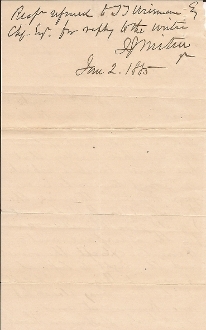 Autograph Endorsement Signed (AES), June 2, 1885, verso ALS (1 page, 8vo.) pertaining to timber going to waste on land.